Why is writing your own About page so damn hard? As you can’t figure out what to write, you make a cup of tea. You stare out of the window; and click around the web. But your search is fruitless. You can’t find any inspiration. How can you make your About page compelling? What should you write about yourself? You might think your About page is about you and your company. But your readers aren’t interested. They want to know what you can do for them. How can you make them happier, richer, or more productive? Which problems can you take away? Which challenges can you help overcome? Your About page is a sales page; and selling starts with understanding what your reader is looking for. Explain what you can do for him. And then encourage him to take action. You don’t wave your business card in front of strangers, do you? Henneke is an irreverent copywriter and marketer. When you describe what you do, avoid words like authority, guru and expert. I’ve never called myself a marketing expert. Let alone a guru. I wouldn’t dare to. Instead, I show you what I know and how I can help you on my blog. Tell people simply what you do, and add an adjective–like irreverent–to give a glimpse of who you are. Henneke is on a mission to stamp out gobbledygook and to add sparkle to boring business blogs. Don’t write a corporate mission. Avoid words like market-leading, best-in-class, and state-of-the-art. Because your mission is not to be the best; your mission tells people how you can help. A good mission energizes or makes people smile. 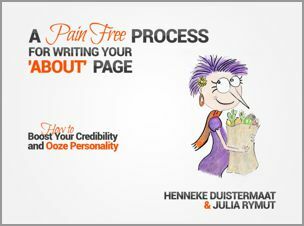 Henneke is the author of two 5-star rated books about writing and blogging, and she’s a regular contributor to popular marketing blogs like KISSmetrics and Copyblogger. Your personal intro can be a 3-sentence caption under your picture or a separate paragraph. And you can use the same approach for your social media profiles. Need to introduce more people? Make your mission part of your company story, and explain how each of your team members contributes to your mission or how they make your client’s lives easier. You might think you need to tell web visitors your whole story–why your company was founded, how it developed, and what it’s like now. But the whole story bores your readers to tears. Consider what you want to achieve with your story. What would you like readers to remember about you? Imagine you’re a passionate web designer. Telling your readers you’re passionate is a waste of precious pixels because everyone says they’re passionate. Instead, share a fascinating detail or tell a mini-story demonstrating your passion. Did you design your first website when you were 7 years old? Have you read tens of books about web design and usability? Have you compiled a history of web design? Inspirational business stories can help you bond with your readers, allowing them to get to know you. But keep it short. Share only relevant details that make your personality shine. Using the first person–I, me, or we–makes your content more conversational. But the third person–she, he, or him–sounds more objective, more credible. First person: I have written two 5-star rated books and am a regular contributor to popular marketing blogs like Copyblogger and KISSmetrics. Third person: Henneke has written two 5-star rated books, and she is a regular contributor to popular marketing blogs like Copyblogger and KISSmetrics. First person: I ask a lot of questions so I can enchant your ideal customers and help you grow your business. Third person: She asks a lot of questions so she can enchant your ideal customers and help you grow your business. In the first example, I prefer to third person because it sounds more objective. The first person version makes me sound like I’m bragging. In contrast, I prefer the first person for the second example, because I’m having a conversation with the reader about how I can help her. I’ve solved this conundrum by writing my personal introduction in the third person, while I’ve written the main part of my About page in the first person. Don’t fuss too much about choosing the first or third person. What’s more important is writing a page that enchants your readers and entices them to contact you. Scan a signature (not your official one!) and add it to your About page. Use a professional picture rather than a holiday photo. Look at the reader or towards your content. Never look away from the web page, because you don’t want to guide your reader away. Each detail should engage your reader. Make him feel comfortable. Lower the barrier for getting in touch. Getting ready to put web site on line and was in a pickle about the About page. Really appreciate the article. You really get to it and always have actionable course. thanks for the post. Excellent read Henneke.Thank you. I thought it was just me, but guess there are a bunch of us writers who struggle with our personal work. Yep, I find it much easier to write for clients than for myself. I guess we’re too close to it. 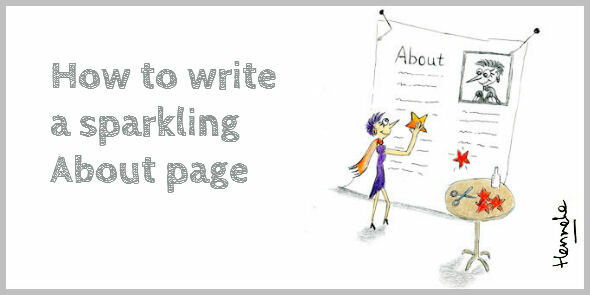 Wow, just as I was trying to come up with ideas what to write in my about page (which wasnt going very well) for my website a outlook notification pops up in the corner of my screen “How to Write a Sparkling ABOUT Page”… Weird.. but Awesome! 🙂 Thanks Henneke, very useful information. Great article – as usual. And I’m glad to see that I’m on the right track with my own About page. I’ve also been preaching this method to clients. Folks feel they have so much to share when they prepare their About pages. The problem is they want to share long-winded, boring life stories that have nothing to do with their business. It’s our jobs as copywriters and consultants to get them to see that making their About story relevant to their business, gets folks more interested. I always tell them “it should be about how what you do solves your client’s problem”. Thanks for sharing, Henneke. Yep, that’s absolutely right, Shelly. We have to be harsh editors of life stories, to ensure they’re relevant and interesting. I always appreciate your words of wisdom and straightforward approach. I have started my blog and am considering using video and images in addition to the text. I haven’t see you ad video or images to yours. How did you make that decision? Thanks for any advice you can offer! I think it’s a great idea to include videos as it allows you to market your blog on YouTube. You might attract a different audience. As a travel writer you’d think I would have had at least one adjective on the page! And I hadn’t really though of it as a sales page so I didn’t even have a call to action. On many websites, the about page is one of the most visited pages, so it’s a good opportunity to get people to take action. when they come in the door. Cause what’s up your sleeve, is your arm! I’ve been reading you for about a year now and am finally taking a moment to stop and smell the proverbial roses to tell you that I’ve been inspired by your no-nonsense perspective on copywriting . You have a refreshing way of taking a task or challenge that typically paralyzes the masses into non-action, and turning it into something even a 12-year old can do! Seriously, thank for breathing life into everyday words. Thank you so much for your kind words, Susan. You capture exactly what I like to do – making complex subjects simple, so we can all improve our writing and win more business. Timely post, I’m working on mine at the moment. I’m not a fan of About Pages written in the third-person by the actual blogger. It comes across as somewhat pompous. Unfortunately, a lot of corporate and business blogs choose this tense and it doesn’t give off an attractive image. About Pages are like the personal introductions people leave on Dating sites hoping to attract a lot of people into replying. You have to know the kind of person you want and hope will be interested in getting in touch. They also have to be written in a way that puts off people you want to avoid. What tea are you addicted to, Tom? I’m a green tea addict. I’m a Tetley Tea man. I’ve tried green tea and herbal teas but have yet to get a taste for them. I’m trying to reduce my milk intake hence the reason for trying out other teas, but – hmmm! they’re certainly an acquired taste. I think your hybrid approach works because it adds to your unique style. Plus, you have a way of making words do enchanting things. One thing I’ve realized is About pages are always evolving. Maybe your focus is changing or you want to highlight something else. It’s a good idea to revisit your About page every few months to see if it still reflects you as well as you thought it did. Yep, that’s an incredibly good point. As the about page is difficult to write, it’s good to revisit it from time to time. Not only might your situation have changed, but you can polish it a little more each time. PS Perhaps we’re both a little too modest, being nervous to write about our achievements in the first person? I wrote my about us right after a meeting with a branding expert who exterminated me. He told me how bland bad uninspiring my back story was (well it is a little). Twenty minutes and a gin and tonic later it was done. It might appeal to your irreverent nature, or he might be right of course. Hey ho, I’m a big girl, others can judge I can take it! I don’t think we all need a fantastically inspiring back story. Often it’s enough to tell people simply why we’re doing something and how we can help them. And can you move your picture to the top right? That would immediately make the page sparkle. Thank so much Henneke. I can’t change the font myself but I’ve moved the pic and added a proper signature. There isn’t a single blog post you have written that I haven’t been able to take at least one actionable insight from. Thanks so much for taking the time to engage on my about us page, I’m a happy bunny! Thanks for reminding us that readers want to know what we can do for them. I appreciate your no-nonsense approach. Even though we’ve seen others do the very opposite of what you recommend, your advice is more to my liking, even the use of both 1st and 3rd person. The thing I love about the internet is we can improve our About page and other content as we learn more and test what appeals to the visitor. Thank you for stopping by, Flora. Another piece of general advice: drink a beer or glass of wine, if you drink alcohol. Seriously, it helps you loosen up and say things in a manner you actually want to say it. There are scientific studies that show we’re more creative, honest, and, of course, less stressed/inhibited when we’ve had just one drink. This is very timely for me as I’m working on my website copy right now! As usual, great tips. I especially like your 3-punch personal intro. Glad you found the tips helpful. Thank you for stopping by! Thanks for this post! I’m blind and can’t face the camera accurately. I’ll be grateful if you can advise me how to put an enchanting picture on my about page? Can you ask someone to help? If so, then tell them to try a few pictures where you face straight ahead or slightly towards the side. If you have to make your photo yourself with a webcam, then your safest bet is to face towards the camera. Thanks ma’am, it did help. I’m bringing my body in good shape to post an enchanting image! Thanks Henneke for such useful tips. I agree that an About us page is about you and your company but thinking that users are not interested in it is absolutely wrong. Thanks a lot for sharing your ideas with us. Yes, the about page is about you and your company, but told in a way that makes it interesting for your web visitor. Web visitors don’t need to know all the details, just what’s relevant for them. They want to know why they should work with you. Thank you for stopping by, Niki. Ack! I just picked out a new photo to use on my About page, but it’s one of me looking out over the mountains, AWAY from the reader. I never thought about the subliminal effect of looking away vs. looking at the reader. As long as you don’t look away from the web page that’s fine. So if you’re looking towards the left and the content is on the left, it’s okay. Thanks. Guess I should give a deep thought about it and re-write my companys about us page soon. Good luck with it, Nanda! “About Pages” can be brutal to read. Henneke’s advice here, as in her two books, is a breath of fresh air. Thank you for your kind words and for stopping by, Stan. You hit the nail on the head. I can talk on the radio for hours, spend months writing books and articles and a danged little about me page had be going for another pot of coffee. Great advice, I really appreciate the information as there is so much contradiction about how to do it “right”. Yep, there’s a lot of contradictory information, so you have to go with what feels right to you. Thanks for this, Henneke. This article really helped me re structure my page. And now my horrible ABOUT page is so much less horrible. I haven’t finished it yet. But your advice made the task seem a lot more manageable. Brilliant. I’d love to know your opinion on “contact” pages. On this website it’s part of the “about” page, but how do you write a good dedicated contact page that’s more than just forms and contact details? I have some difficulty finding useful advice on that. Contact pages often look so boring, that I lose interest in contacting a company or person. I’d recommend adding a picture and one or two short sentences as introduction, showing that you are interested in hearing from people, and perhaps explaining why they should contact you. I like how simple but powerful your About page is. I’m updating mine this weekend and I’m glad I decided to check if you had a blog post about this! Hi Rhonda – thanking you for letting me know. I love it that you decided to look whether I’d written something to help you with your “about” page. Have fun writing! This is something cool that i was looking for. I have spent more than 1 hour thinking to write a about us page for my website and i was going though many samples. I would simply say thank you for the awesome post that helped me writing a about us page for my website. Henneke, I just want to say that YOU GIVE GREAT VALUE. I was writing an article earlier this week for a client, about “inbox burn-out,” wherein you’ve opted into too many offers and ended up having too many marketers attempt to “build a relationship” with you by hammering you with thinly-veiled sales attempts. End result: unsubscribe. In the article, I made it clear that I was not generalizing about all such marketers. Enchanting Marketing and Copyblogger entered my mind as examples of marketers who (1) provide great value and (2) don’t over-communicate to their audiences. PS: Did you send out a message recently about an e-book you wrote about how to write About pages? Thank you so much, Steve. That’s a wonderful compliment. I do my best to always provide value to my readers as I know everyone’s time is precious. … this is an awesome post – I’ve read your stuff on Copyblogger and KISSmetrics and bought your book in 2014 (and again last night a I lost version one in a house move – duugghh . What I like about your writing is the down to earth approach and the way it has its own character – really good. When did you start your copywriting journey and what compelled you to take this path in life… if you don’t mind me asking ? Just one question? Will the friendly tone work for corporates? Or should we write in a more formal tone for them? What do you say about that? It depends on a company’s style guide, but corporates can write with a human voice, too. That was so helpful Henneke writing about yourself can be so hard. In fact I’ve heard of branding agencies getting someone else to create their brand rather than attempt it themselves. Yes, so true. It is hard, and asking for help can make it a lot easier to get an About page written. I wonder if I can apply similar principles to my about page on my fiction author website? Yes, I think so. With creative work, you can talk a little more about yourself and what inspires you, too. Readers are often interested in the life of the author and their creative process. Thank you Henneke, that is most probably every one’s sore spot, how to write the about page, you don’t want to sound like bragging about your achievements, but you still need to let them know, what you can do. As always, you know how to do it best. Thank you, Annamarie. It is indeed a tricky page to write! I started writing poems in my second year of university at the age of 20. The popularity of my protest poems against apartheid (I am South African) encouraged me to write newspaper articles. I entered writing competitions in my fourth year and won two of the four I had entered. When I started working, I made a BIG mistake. I stopped writing and concentrated on building a corporate career in marketing. After wrenching my soul for more than 20 years in the corporate jungle and other enterprise ventures chasing power and money, I am now in the process of embarking on a writing career. And what a great and exhilirating feeling it is to write again! I have rediscovered my mojo, I feel connected to my soul again and I’ve a purpose and a mission that is in sync with my passion for words, ideas and creativity. writers I can model my writing after, I was lucky to find Jon Morrow, who I think is nothing less than brilliant. And now I am greatful to have found you, Henneke, as my business writing tutor and coach. As I said, I can’t thank you enough Henneke for helping me to shape and guide my writing. In a proposal I’ve crafted for my potential clients, I’ve credited you for the generous blog articles that have tremendously helped me to develop my writing. I’ve also opened up to my prospective clients that thanks to Henneke’s content writing courses and books, I can now give them a better service. I further told them that “in my book, Henneke is the best online content tutor in the world; and that if there was a wall of fame for copywriters, Henneke would be up there among the very best in the craft of copywriting”. Wow, Lucas. What a comment, or rather: what a compliment! Thank you so much. You’re making me blush. It makes me happy to know that my blog is inspiring you on your writing journey. Running to change my About US page after reading this.